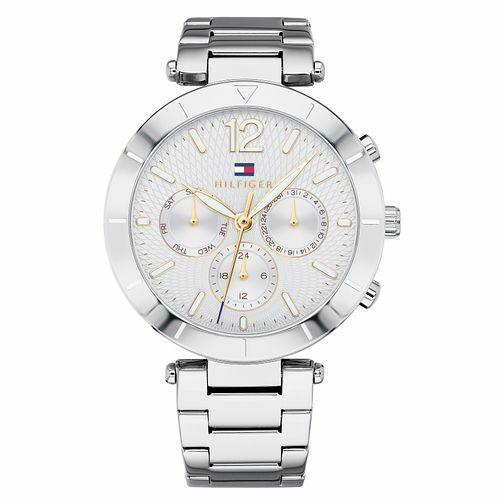 Tommy Hilfiger offers a sophisticated twist on traditional sports styling with this ladies' watch. This multi-function watch, in stainless steel, features a 38mm case and a dial detailed by day, date and 24-hour sub-eyes. White-accented minute and hour hands and the Tommy Hilfiger flag logo at the 12-o-clock position add signature style to this chic design. Offered with a comfortable sleek stainless steel bracelet.